I’m so excited to share with you the brand new music video for “S.A.M.B.A. (Shiva’s Adoration of Mata Bhavani’s Ambrosia)” filmed in Rishikesh, India. 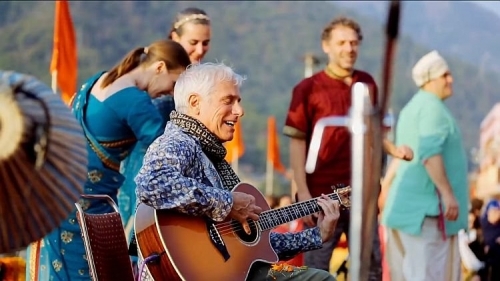 Recently, my family, a small group of Bhakti brothers and sisters, and I converged on the banks of Ma Ganga (the Ganges River) to film a video for my new album, ROOTS, ROCK, RAMA! The song we focused on was “S.A.M.B.A.,” a prayer to Lord Shiva, which brings together the ancient culture of India and the Afro-Brazilian musical expression from Bahia, Brazil. Well, within a day we had our airline tickets. Parmarth Niketan Yoga Ashram in Rishikesh said “in the same of Sri Krishna” they’d host the concert; Sushant Mohan, our friend and local event producer said “in the name of Bholenath (Lord Shiva)” he’d promote it. Gaura Vani, Visvambhar, Kamaniya and Keshavacharya Das all said they were already going to be in India (!!!!) and, believe me, the wheels were rolling. Prajna Vieira, who sings with me almost all of the time here in California, and Gui Vitali, a great Brasilian friend and percussionist, both launched GoFundMe campaigns and had their tickets within a week. And, best of all, Ezra’s sixth grade teacher said he thought two weeks in India would be WAY more valuable than two weeks in school!!!! Me, myself and I, well, inside I was freaking out, but the call of spirit was just too strong and, despite all my fears and doubts, I couldn’t say no…. However, anyone who knows India — in fact, anyone who knows LIFE — knows that not everything goes according to plan! But after many crazy mishaps and some very serious challenges, the video was completed and is now ready to be shared with the world. And I love it!!! Aside from expressing so perfectly the feeling of the song, it gives you a glimpse into the lives and hearts of my family and my friends, and invites you to come and join us on this endless pilgrimage of love. P.S. If you love ROOTS, ROCK, RAMA! please please please post a review on Amazon or iTunes…. Thank you so much! P.P.S. Remember that for every CD sold, a tree will be planted through OneTreePlanted.org. The whole world’s myriad musical colors coruscate like a bejeweled shawl tossed from the shoulders of a goddess on this landmark two-CD recording. It manages to pack a lifetime’s spiritual and musical quest into seventy-eight minutes of glorious music from an innovator whose work transcends any category or genre designation.